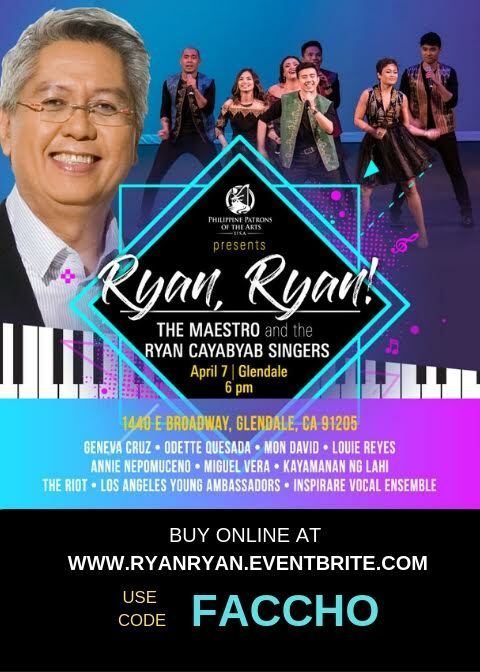 If you have heard of the music of Ryan Cayabyab, you should go watch the concert on Sunday, April 7 in Glendale, California. 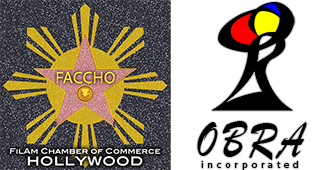 Use the Filipino American Chamber of Commerce Hollywood's special discount code - "FACCHO" when you purchase your tickets at www.ryanryan.eventbrite.com . (6) Watch and be inspired by Philippine artists and culture with collaboration with local artists, as experienced their past tours. This is the Ryan Cayabyab Singers 3rd concert tour, and the first after MrC was conferred the title National Artist for Music, a lifetime achievement government award, the Philippine version of the Kennedy Center Honors. MrC received this not only for his music, but for his Elements, Songwriting Camp, Philpop Songwriting Competition, Akapela Open Acapella singing competition, and the Music School of Ryan Cayabyab. The concert will be in Glendale at the John Wayne Performing Arts Center, 1440 East Broadway, Glendale, CA 91205 on Sunday, April 7 at 6pm. 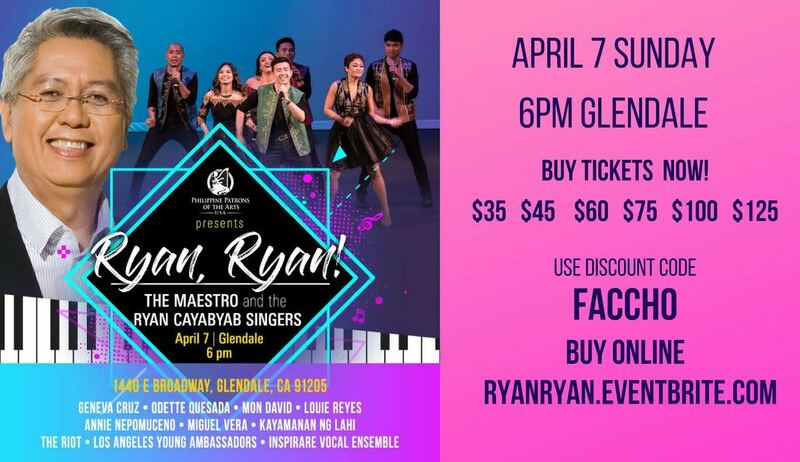 If you had been to Music Arts Events productions at the Ford Amphitheatre, Valley Performing Arts Center, Aratani Theatre, and Alex Theatre, you would know that they do not do Filipino time. Get your tickets online on at www.ryanryan.eventbrite.com and don’t forget to use the promo code FACCHO. Tell your friends and family about the show! Get your tickets now before they sell out!